The Armada Compaq Laptop M300 Maintenance and Service Guide has been released by HP at their website. The Armada Compaq Laptop M300 maintenance & service guide is provided in PDF document format (102-pages, PDF, 1.67MB) that you can download directly from HP website. 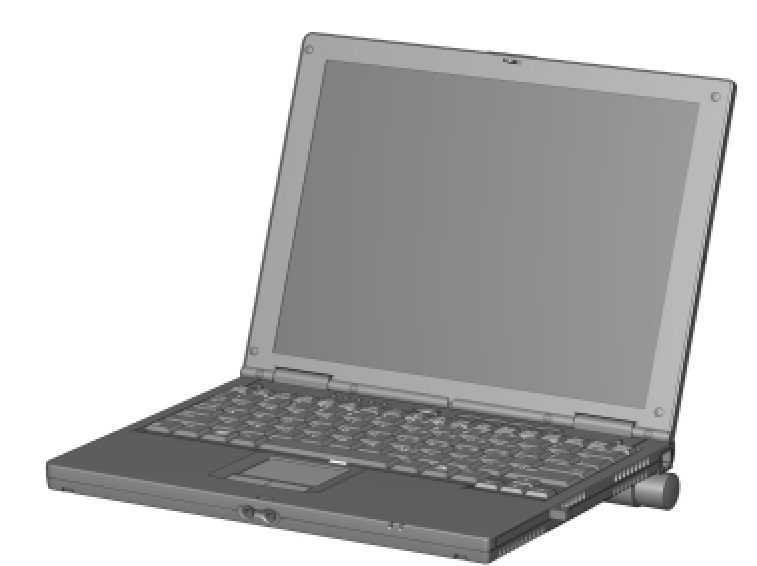 You can read this Armada Compaq Laptop M300 service guide by using PDF reader software/application. The Armada Compaq Laptop M300 service guide contains complete reference information about how to operate & self service the Armada Compaq M300 laptop properly, such as how to replacing the hardrive, how to replacing the battery, basic troubleshooting and many more. 3.3 pound (1.4 to 1.5 kg) computer (depending on configuration). It allows users high mobility, provides a full set of system ports, and when paired with the optional MobileExpansion Unit (MEU), transforms into a full-function portable with enterprise docking capability. Intel Pentium III 500-MHz, Intel Pentium II 333-MHz, or Celeron 450- or 333-MHz processor, with 256-KB integrated L2 cache (Pentium III or II) or 128-KB integrated L2 cache (Celeron), depending on computer model. ATI RAGE LT Pro, 4-MB SGRAM (synchronous graphics). Standard 64-MB high-performance synchronous DRAM (SDRAM), expandable to 512 MB. Dual preinstall of Microsoft Windows 95 and Windows 98 or Windows NT Workstation 4.0 and Windows NT 2000 preinstalled*. 11.3-inch XGA CTFT (1024 × 768) and 11.3-inch SVGA CTFT (800 × 600) displays with 16 million colors, depending on computer model. 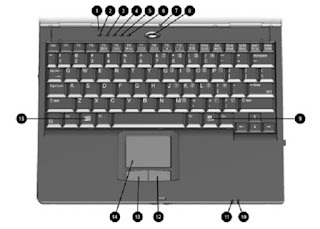 Keyboard is 95 percent of full-size with TouchPad pointing device. Mini PCI 56K V.90 modem, or optional Mini PCI V.90 plus 10/100 NIC combo card. One Type II PC Card slot with support for both 32-bit CardBus and 16-bit PC Cards; zoomed video support. External AC adapter with power cord. Lithium ion (Li-ion) battery packs. - Standard: 4 cell, 26 Watt hours (externally attaches to computer). High-capacity SMART hard drives, 12.0-, 6.4-, and 4.3-GB, with DriveLock security and Prefailure Warranty, depending on computer model. Ultraportable form factor, 0.89 inch (2.3 cm) thin with weight starting at 3.1 lb. (1.4 kg), depending on configuration. Standard external diskette drive (attaches to system through the parallel port or fitsinto the mobile expansion unit diskette drive bay). - Flexible MultiBay that accommodates: 24X MAX CD-ROM drive or DVD-ROM drive, SuperDisk LS-120 drive, weight saver, second Li-Ion battery or secondary 6.4-GB hard drive. - Additional ports: parallel, serial, audio in/out, VGA, USB, PS/2 (2), AC power in, CPUconnector, docking connector. - Robust, common enterprise docking solution. 1. Display switch: Turns off the computer display if the computer is closed while on. 2. Scroll lock light: On: Scroll lock is on. 3. Caps lock light: On: Caps lock is on. 4. 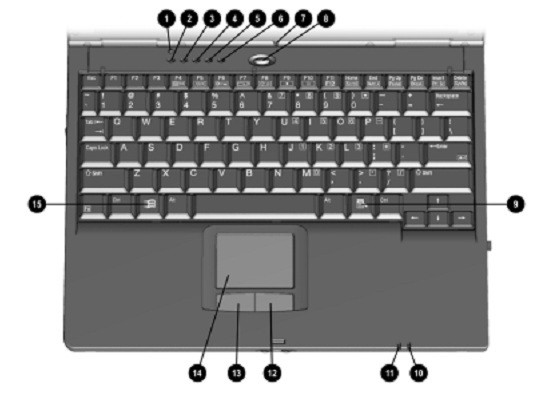 Num lock light: On: Num lock is on and the embedded numeric keypad is enabled. 5.Hard drive light: On: The primary hard drive is being accessed. 6. Diskette drive light: On: The external diskette drive is being accessed. 7. Internal microphone: Supports audio input when the display is open or closed. 8. Suspend button: Initiates and exits Suspend. * When pressed with the Fn key, initiates Hibernation. 9. Windows application key: Displays shortcut menu for item beneath mouse cursor. 10. Battery light: - On: The battery pack is charging. - Blinking: The battery pack, that is the only available power source, has reached a low-battery condition. 11. Power/suspend light: - On: Power is turned on. - Off: Power is turned off. 12. Right mouse button: Functions like the right click button of an external mouse. 13. Left mouse button: Functions like the left-click button of an external mouse. Used with the TouchPad to drag and highlight. 14. TouchPad: Moves the mouse cursor, selects, and activates. 15. Microsoft logo key: Displays Windows Start menu. 2. Disconnect the computer (Section 5.4). 3. Remove the battery pack (Section 5.6). 4. Disconnect and remove the Real Time Clock (RTC) battery (Section 5.10). 6. Reconnect the RTC battery. 7. Reconnect the AC Adapter. Do not reinstall the battery pack yet. 8. Turn on the computer. NOTE: Remember to set the date and time the next time the computer is turned on. The following download link is for Armada Compaq Laptop M300 service guide & troubleshooting. The service guide is provided by HP website. The service guide offers comprehensive information about the PC that would be useful for any of you who are using this computer.